This is a good friend of ours, Julie. She's the good looking one in the middle of the two goofy guys (her husband Dan, and me). I've known Julie and her family for over 10 years now... since before I was an old married man! I've sung with her at our church in Portland. We've vacationed with her and her family in Italy. She sang at our wedding. We've borrowed her dog on more than one occasion, walked in a good ol' fashioned, small-town Fourth of July parade with her, and sat up late into the night chatting over cups of coffee at their seaside cottage in Oregon. If you know Julie, you know a bit about her heart already. Her heart to lead people in worship. Her gentle nature that lets people just be themselves around her. Her love for her kids, her husband, and just about anyone she comes in contact with. She brings out the best in anyone she's around. Well, Julie surprised us all this last week when she had a heart attack while on vacation with her family in Chicago. On Monday, surgeons are going to repair a problem with Julie's heart that none of us ever knew was there... one that's been hiding in there all of her life. Please pray for Julie, her husband Dan, and their three daughters as they face this crisis. They're a long way from home, living in a hotel... and she's about to have major surgery, and undergo a long recovery period before she can head home. We're just off Kickapoo road at the International Youth Finals Rodeo (IYFR) at the "Heart of Oklahoma Exposition Center", Shawnee, Oklahoma in - say this one out loud a couple times - Pottawatomie County, Oklahoma. As with any traveler entering a foreign culture for the first time, one of the first tasks was to get "gussied up" for the big event. Fortunately, the rodeo is equipped with a Western Market, stocking all manner of cowboy ("And cowgirl, Daddy!" - Danna) paraphernalia. We passed on the $2400 saddle, but picked up a set of "real cowboy" (and girl) hats. Upon trying his new hat on, Jad declared that he was going to become the "most famousest cowboy ever", and Danna broke into a dance in front of the mirror, trying on her best "Cowgirl Licia" face (her alias while in cowgirl gear). Suitably equipped, we picked our way through the horse trailers, motor homes and big, muddy trucks to the grandstand just in time for the big show. More horses flew into the ring, each rider carrying a flag with one of the letters of the State's name. By the time the final "Yeeow!" rang out from the bleachers, the crowd was ready for a party. 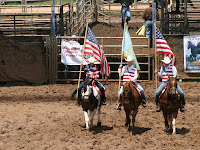 The chaplain said a quick prayer for the soldiers, the cowboys (and girls) and the livestock, and the show was on! Oh... they did also manage to sneak in a quick rendition of the national anthem while the US flag was on the field and everyone was standing, hats in hand for "Oklahoma!"... but it was pretty clear that the audience's true alliance was with the state with "plen'y of air and plen'y of room." Official songs out of the way, the rodeo got underway! For the next several hours, we were entertained by a procession of cowboys (and girls) roping and 'rasslin all manner of cows and goats, and riding horses that were doing their level best to buck them off! 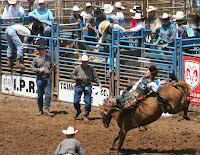 Did you know that a good cowboy can rope and 'rassle a steer in under 8 seconds? That a cowgirl who's worth her salt can tie a goat in 7 seconds flat? Oklahoma's record rain in the past month added a healthy dose of mud to the festivities. But then real cowboy boots are supposed to be muddy! This is what home leave is all about! Getting reacquainted with authentic American culture. Learning new songs. Wearing cowboy hats. Slurping down refreshing drinks from Sonic. That's the news for now, from the Heartland of America! 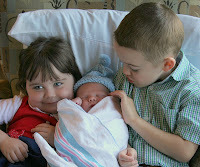 I got to wake up Jad and Danna yesterday morning with the news of their new little little brother. Jad's first words when I told him he had a new baby brother? "Yipee!" 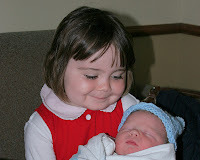 Overnight, "Baby Waby" transformed into "Baby Kyler", and Danna proceeded to prance around the house chanting "Baby Ky, Baby Ky, Baby Ky."
Danna assumed her role as a protective big sister right away. In the afternoon, after holding her baby brother for a couple minutes, it was time head home. She looked at her grandmother with big, concerned eyes and asked "Tayta, you take care of Kyler for me?" We're very pleased to introduce... all the way from Edmond, Oklahoma - and our first child born in the USA - Kyler Kevin Rubesh. Vital stats? Seven pounds, five ounces (3.4 kilos), and 20 1/2 inches (52 cm) long. Following in the example of his brother and sister, Kyler arrived a little early - at 37 weeks. In fact, while we were in the middle of debating his exact arrival date with the our doctor, he just decided that he'd had enough of the womb and wanted to get out and start having fun with his family! Erin started having mild contractions yesterday afternoon, so we rushed her into the hospital to get looked at. Though the contractions quickly subsided and it didn't look like she was beginning labor, we decided that it would be safer for her to spend the night hooked up to the monitors at the hospital. Sure enough, at around 2:00 AM, Erin's water broke, the doctor was paged, and the race was on! Kyler made his grand entrance at about 4:00 AM, and both he and Erin are doing marvelously. Thanks for all your prayers through this pregnancy, and continue to pray for Erin as she recovers from her cesarean section. OK, so I'm cheating, but just a little bit. These pictures were actually taken on the 6th... the day before the day before. At the time, we had no idea that Kyler would be born in just a couple days. What we did know is that we wanted to get a couple pics of Jad and Danna with Erin and "Baby Waby". These turned out too well not to share with y'all. On the left, the kids are giving their brother a kiss. For the shot on the right, I told them that Baby Waby was trying to say something to them. They were listening hard to hear him! Mastiffs, Chiwawas and Poodles, oh my! The OKC Summer Classic Dog Show was the Rubesh kids' latest stop on the list of "fun things to do in Oklahoma City." This time, I got to tag along, have fun and take pictures as well! I flew to Oklahoma a week ago, and have been enjoying life as a full time Dad for the first time in seven weeks! Back to the dog show... we got to see just about every breed of dog there is. From Danna's favorite (a long-haired Chiwawa) to a Great Dane which was an inch or so taller than Jad. Question for you all... who's the genius that decided poodles had to have such a funny looking haircut? Most of the poodles we saw were getting final blow drys, getting ribbons tied in their hair, and looked postively embarassed by the two poofs of hair on their butts and ball of hair on their tails. Three quarters of us decided that a much better family dog (once we get settled down in Europe) would be a Bullmastiff. Erin waddled over and sat down next to one of these gentle giants and it immediately snuggled its 180 pounds of muscle up to her and switched into "protective mode." 3/4's of us? Yep - Danna's holding out for a little "yippie puppy." First things first though - we're eagerly awaiting the arrival of "Baby Waby" - with an expected due date sometime around July 15th. We've toured the hospital, and still debating names (how about "Edmond" after the town he'll be born in?) Jad and Danna made a unanimous decision this afternoon at lunch that "Fred" would be a great name. Coincidentally, Jad had been playing with an imaginary turtle he'd named "Fred" earlier in the day. Check back here for news as soon as we have it for you!